God is in control, even during the Abortion Wars. There has been increasing proof that the Abortion Wars are cloaked in religion, and Planned Parenthood, NARAL, NAF, and others have exploited this fact for decades. Over 85% of post abortive women identify with a ‘religion’. How much more evidence do we need to see that our Risen Savior is used to PROMOTE abortion by deceptive religions and denominations? This post isn’t just about the sanctity of LIFE, this is about those that clothe themselves in religious garments advocating killing unborn life, outwardly deceiving women. Read more about the proabort pulpit here. The ‘Religious’ Coalition for Reproductive Choice is leading this deception to further the abortion agenda within religious circles. These zealots that repeat the abortion mantra have no interest in who Jesus really is; they see him as a man who lived and died, did some good things, never spoke above a whisper. Nothing can be further from the truth. The RCRC [and others] have made Jesus Christ a political figure, not a Savior. People want to know which religion or denomination that advocates for LIFE – but the short answer is don’t follow man, follow Jesus. God forgives, religion condemns. But will the religious abortion wars repent? We pray that those who believe in aborting God’s creation will relent, repent, and serve God. That is always the hope. Christians with a true relationship with Jesus wants to see souls saved, not condemned to hell; judgement lies with God. I am a sinner saved by Grace, all have fallen short of the Glory of God. Then, even they who have advocated for millions of abortions, can be saved from a hell they deserved, the very same one I deserved before coming to Christ. God does not forget, nor does He pass by sin without judgement. I assure you, God is quite secure in who He is, not who the sanctimonious believes He is. They have made God a puppet and Jesus a byproduct of Him just to satisfy their agenda to kill unborn children ‘without apology’. Read more about Abortion and the Church here and here. Witnessing on a public right-of-way is just as biblical NOW as it was in the times of Jesus. However, public being ‘public’ means that we have to share a public venue with religions who may not hold to the very foundation of Christianity. Think of it, all ‘religions’ are in prison ministry, homeless ministry, prolife ministry, etc. Then, what do we do as Christians – evangelize the lost or tell the other religions that come to the same venue they’re doing it wrong? Hold fast, hold true, and hold on! Strike a balance or you are just as guilty as a man-made ‘doctrine’ that soothes the seeker, not save the lost. Always remember your task at hand, don’t sway to conformity, preach the Word. If it is your ‘ministry’ to go to venues and tell everyone they are doing it wrong – not witnessing to YOUR specifications – then you do not do the Will of God. If your are in public ministry as we are, remember the public does not need to see your displeasure with a fellow servant. That will create chaos that cannot be ignored. Remember your venue, remember Who sent you, remember the servant who led YOU to the Lord. PRAYER TIME: I claim Jesus FIRST. Waiting to die is not the abundant LIFE Christ has for us or died for. There is a time in our church service when Pastor asks what our prayer needs are. And as I looked around, I see and hear what is contradictory to FAITH. It seems to me that many Christians have faith in the Pastor and Church, not so much in what Jesus did for each of us at the Cross. Has the Church given up on the basics of Faith and left it at the foot of the….pulpit? Do we limit God? “We are hard-pressed on every side, yet not crushed; we are perplexed, but not in despair; persecuted, but not forsaken; struck down, but not destroyed…” 2Cor 4:8-9. In many churches, there is too much sickness and strife, and I have to wonder if they think that prayer is a magic wand for other people and they just get the bits and pieces left over. Do they not have enough or any faith for themselves? Where is Faith? Yes, Faith in the Cross is key, but are Christians leaving Faith there rather than living through Faith in Him because of the Cross? Can we ever truly realize the power God gave us? Is this preached or taught in the Church? The Pulpit has to equip their flock to have this power. Then, is the Pulpit keeping this ‘secret’ to themselves or are they NOT equipped? I wonder at times if Pastors want their flock to believe only he or she has the answer. Protestant Churches [Episcopal, UMC, UPC, etc] deny the power, thus the deity, of Christ and put themselves in the position to be as God to their congregation. They go AWAY from the Cross of Christ TO a worldly appreciation of abortion, gay agenda, and liberal social justices that deny God. Parishioners of theses denominations expect the ‘Pastor’ to do the work for them, using the Pastor’s magic wand. Get your head out of your hands, look up…and believe. I cannot agree more. The writer did a great job of what has been on my mind. As I’ve written before about being on the OTHER side of addiction, this so-called ‘disease’ is a nasty byproduct of sin. Since reading through the scriptures it’s easily seen that God is not a respecter of persons and every person is accounted for and precious to Him. Simply put addiction is the fact or condition of being addicted to a particular substance, thing, or activity. The disease model of addiction was introduced some 40 years ago and is used in treatment programs and the like and taught to addicts and alcoholics. It was back then that addicts and the like were even more persecuted than they are or can be today and with the model it was thought the prejudice would lessen with this theory. So when they came out with addiction being a disease like Alzheimer’s, Diabetes, etc. it started to open the eyes of society to believe that these addicts were not to be crucified for their problem, but to be seen as sick. People, especially treatment centers and addicts, were enthused because they weren’t being seen as bad by the public or media anymore. I do not believe for one minute that Christians understand anything about proper stewardship. Of course no one is perfect, but it’s as if no one is trying to stay out of debt and give as God wants us to. God wants to bless us but instead we want to BE God and bless ourselves with the newest smartphones, cars, clothes, jewelry, etc. Christians need to think in terms of what God has provided. His provision is perfect while our expectations are hugely inflated: “But seek ye first the kingdom of God, and his righteousness; and all these things shall be added unto you,” Matthew 6:33. 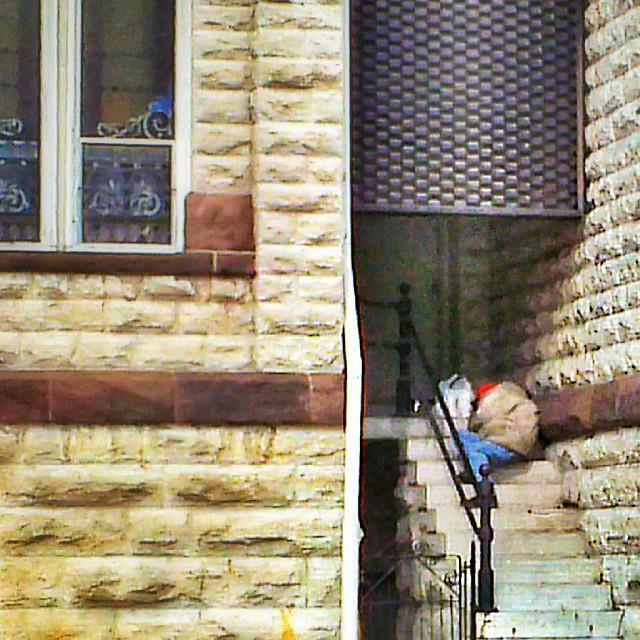 A homeless man asleep on the steps of a Church – their doors were closed. “No servant can serve two masters; for either he will hate the one and love the other, or else he will be loyal to the one and despise the other. You cannot serve God and mammon,” Luke 16. Hmmm there it is….are we a servant in Christ or just shrugging along from church service to church service? Conversely, we’ve held onto things for fear of not having enough. Again, it’s a symptom of not trusting God. But when God gives you to overflowing, it’s because He has plans for it! As Christians we are to ‘love our neighbor‘; God gives an abundance for us to use to help His children, not keep back from them: ‘But God said “Fool! This night your soul will be required of you; then whose will those things be which you have provided?” So is he who lays up treasure for himself, and is not rich toward God’, Luke 12. I have to admit, I love our minimalist lifestyle. I feel free of the world and it’s traps. I can’t stand the frivolity of the way some Christians live; we are at war with the devil himself and we clamor for more clutter. And more clutter dims the view of our Savior. Love your neighbor as yourself, give to give, and God will Bless you more and in more ways than you ever could imagine. Minimalism will show you what you need rather than what you think you deserve; Christian minimalism shows you who you can help with the abundance you actually have. Don’t be religious…be a Christian. And love. CHURCH: As the pulpit goes, so goes the nation. We have abortion as law because the Church allowed it. Preach LIFE, love the unwanted and unplanned; they are the ‘least of these’. Just as it was, so shall it be. We have spent so much of our lives telling God NO or LATER or SOME DAY. We took our lives, created and purposed by God, and rearranged them with sin and idol worship. v25 And he overthrew those cities, and all the plain, and all the inhabitants of the cities, and that which grew upon the ground. Let this encourage you! No matter how far you have gone, you can come back! Yes, there are consequences and repercussion for sin but He gives us STRENGTH mightier than Goliath!